Well, I believe wp guys have got excellence in making things easier for the developers. Last day, I had a client asking me to do something which will allow him to change the footer text sitewide(for all blogs) on his buddypress based blog network(or social network :)). I googled it and found something similar, but was a paid plugin(ahh, the membership fee was too much for me to afford for one plugin), so I decided to investigate further. After Looking at admin-footer.php, It seemed a trivial task. there exists a filter “admin_footer_text”, which allows you to change the footer content. Glad, I could never know, It was so easy. 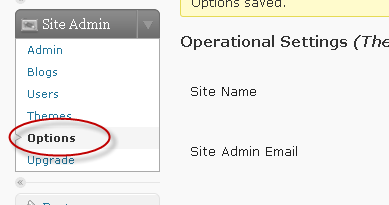 So, I went ahead and put an option in the SiteAdmin->Options and, yeh, Now the Site admin can change the footer globally. It allows SiteAdmin to change the footer links/text globally/sitewide on their wordpress mu/wordpress mu+buddypress based site. Install It like, any other wordpress Mu plugin. Enter the text/html you want, and Click Update options. wow, you are Done, Now check the footer, It should show the text/html you entered. Here is a screen shot from my local test system. Let me know your thoughts/suggestions or anything you want In the comments below. Thank you. It’s working on a test WPMU install with MU2.9 trunk-r2011 with BuddyPress 1.1.3 trunk-2163 with internal bbpress. Cheers.